The purpose of the Pre-Trip Inspection is to make sure the commercial vehicle is safe to operate, and to see if you have the knowledge and skills to inspect your commercial vehicle. A pre-trip inspection is a good idea every time you go to work in a commercial vehicle which is why the DMV takes pre-trip inspection very seriously. This inspection requires the truck driver to have expert knowledge of each system on the Tractor-Trailer. The DOT / DMV certified inspector will walk around the inside and outside of the commercial vehicle and ask what does this do? The trucker must explain how gear shifters work or how to test the air brakes before leaving, etc. Both of you will walk around the vehicle and point to or touch each item (system) and explain to the DOT examiner what you are checking and why it is important. You will not have to crawl under the commercial vehicle, but you will have to bend down and point to king pin and explain how it locks, point to brakes and explain how to test them for safety, point to the transmission and explain the drive train, point to all lights and make sure no cracks, this includes lights around the tailor. Every commercial truck driver carries a small wooden bat to hit the tires during a walk around this is to test for leaks and damage, so do not be surprised when he points to the log book and asks what is that for and next to it is a small wooden bat. Then he will ask why the bat? You can count on a question about how the air brake hoses connect. The air brakes endorsement test is the most often failed CDL TEST, so take the time to learn everything you can about commercial vehicle air brakes and how to check their safety. AT CDL-TEST.com we place your CDL truck driving career onto THE FAST TRACK OF SUCCESS! Passing the walk around during PreTrip Inspection is EASY compared to passing the road skills driving test. You will take a 53' foot tractor and trailer out for a spin with a DMV / DOT Certified Instructor. The most common missed question is about clearance. When approaching a bridge or overpass there will be a sign stating the height of the bridge. After going under the overpass or bridge the DMV / DOT Certified Instructor will ask "what was the clearance just then?" And you must know the height of your commercial vehicle including the trailer height, and how much room you have to spare is considered your 'clearance'. IF you get it wrong on the job your trailer will smack into the bridge. There is no room for error for the professional truck driver. For more tips on how to pass the Road Trip Skills Test during a CDL TEST watch this VIDEO! This video will teach you how to pass the Road Trip during your Skills Test. commercial CDL drivers should know. You must pass a test on this information to get a CDL. This section does NOT have specific information on endorsement questions found in combination vehicles, doubles & triples, or transporting passenger vehicles. Each CDL endorsement will have its own section below. This CDL Handbook does have basic information on hazardous materials (HazMat) that all commercial truck drivers should know. Important: If you need a HazMat endorsement, you should study Section 9. • Knowing your cargo is properly secured. If you intend to carry hazardous material that requires placards on your vehicle, you will also have to have a hazardous materials endorsement. Section 9 of this manual has the information you need to pass the hazardous materials test. Bus drivers must have a commercial driver license if they drive a vehicle designed to seat more than 15 persons, including the driver. Bus drivers must have a passenger endorsement on their commercial driver license. To get the endorsement you must pass a knowledge test on Sections 2 and 4 of this manual. (If your bus has air brakes, you must also pass a knowledge test on Section 5.) You must also pass the skills tests required for the class of vehicle you drive. This section tells you about air brakes. If you want to drive a truck or bus with air brakes, or pull a trailer with air brakes, you need to read this section. If you want to pull a trailer with air brakes, you also need to read Section 6: Combination Vehicles. Air brakes are really three different braking systems: service brake, parking brake, and emergency brake. • The service brake system applies and releases the brakes when you use the brake pedal during normal driving. 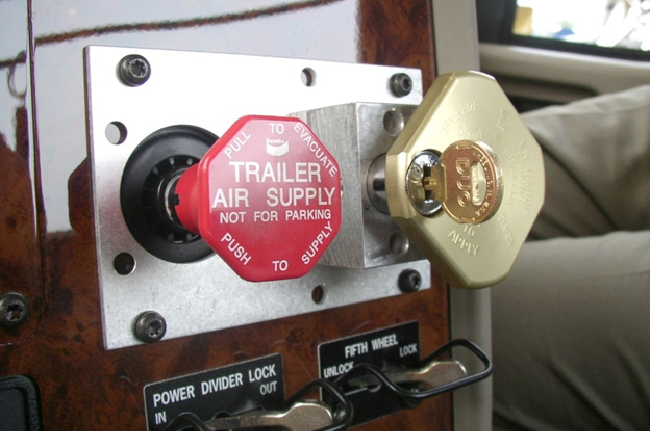 • The parking brake system applies and releases the parking brakes when you use the parking brake control. • The emergency brake system uses parts of the service and parking brake systems to stop the vehicle in the event of a brake system failure. This section provides information needed to pass the tests for combination vehicles (tractor-trailer, doubles, triples, straight truck, and trailer). The information is only to give you the minimum knowledge needed for driving common combination vehicles. You should also study Section 7 if you need to pass the tests for doubles-triples. 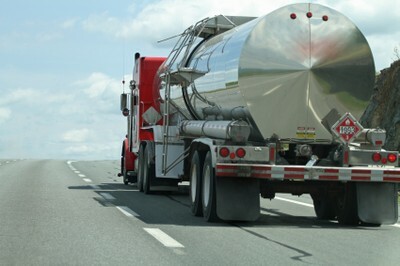 This section has information needed to pass the CDL knowledge test for driving a tank vehicle. (You should also study Sections 2, 5, and 6). A "tank vehicle" is used to carry any liquid or liquid gas in a tank of 1,000 gallons or more. School bus drivers must have a commercial driver’s license if they drive a vehicle designed to transport (seat) 16 or more persons, including the driver. School bus drivers must have a school bus endorsement in addition to a passenger endorsement on their commercial driver’s license (CDL). To get the school bus endorsement, you must pass a knowledge test on sections 2, 4 and 10 of this manual. (If your school bus has air brakes, you must also pass a knowledge test on Section 5.) You must also pass the skills test required for the class of school bus you drive or intend to drive. This section does NOT provide information on all the federal and state requirements needed before you drive a school bus. You should be thoroughly familiar with all specific school bus procedures, laws and regulations in your state and local school district.